omid (mashhad, Iran) on 27 June 2016 in Abstract & Conceptual and Portfolio. This atmosphere is fantastic. Gorgeous composition. Beautiful scene and silhouettes in back light ! Beautiful back light! Superb scene in B/W! Un très beau contre-jour avec des ombres très bien inscrites dans la lumière! و مهن ترین نکته دوران سربازی اینه که هر چی مامان شون و بعدها همسرشون میپزه با جان و دل میخورن و اصلا کوچکترین شکایتی نخواهند کرد البته این وسطا یه سری استثنایات هم هستن. I like how you framed the child between the men on shore. Very nice shot. un gout d'été mais que le petit qui se baigne... les grands ne sont pas téméraires. Beautiful light, composition and silhouettes ! Excellent exposure and monochrome, wonderful result. A dramatic silhouette close by with the ocean far below. A fine shot. A beautiful against the light! So excellent... were the moon is? over the sea!!!! Their looks in the same direction ... of their childhood? Magnificent light in this back light! Beautiful silhouettes. Altogether photo is wonderful ! Beautiful silhouettes and silver sea! Wonderful moment captured! Excellent B/W image nice shot. That is excellent. Terrific black and white and silhouette. 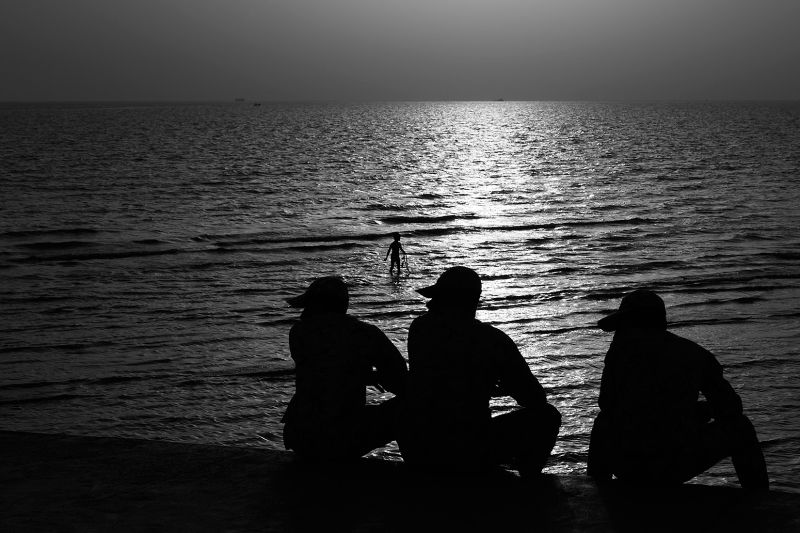 Nice B&W shot with silhouettes. Beautiful monochrome ... The silhouettes and light are fabulous !!! Splendid backlight, magnificent shot, greetings !! !